The Laughing Gull is a medium sized gull that breeds on the Atlantic coast of North America, the Caribbean, and Northern South America. It gets its name from its high-pitched laughing call. The Laughing Gull is not a good hunter and rarely catches live food from the sea, rather it picks up marine animals from beaches and marshes. Much like most other gulls, it is a good thief. It has a distinctive nearly black hood in summer which fades during winter. 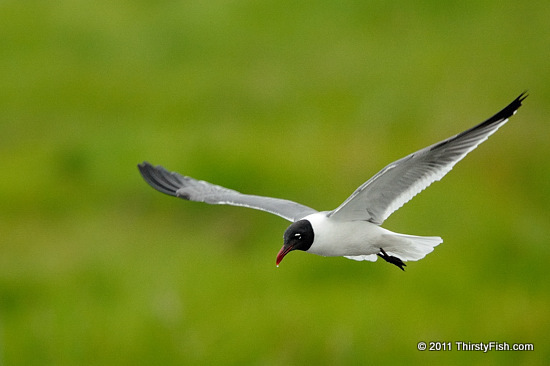 The Laughing Gull is a useful scavenger that cleans harbors and beaches of trash and stranded fish. Scavengers eat dead plant and animals and play an important role in the ecosystem by contributing to the decomposition of dead. Decomposers complete the process by consuming the remains left by scavengers. Without decomposers and scavengers, the world would be covered with dead plants and animals. Somehow, everything seemingly has a purpose, but what is the meaning of it all?